This home is a great example of a Queen Anne Style Victorian Cottage. George D. “Chauncy” Adams and Josephine E. Adams were the first residents. 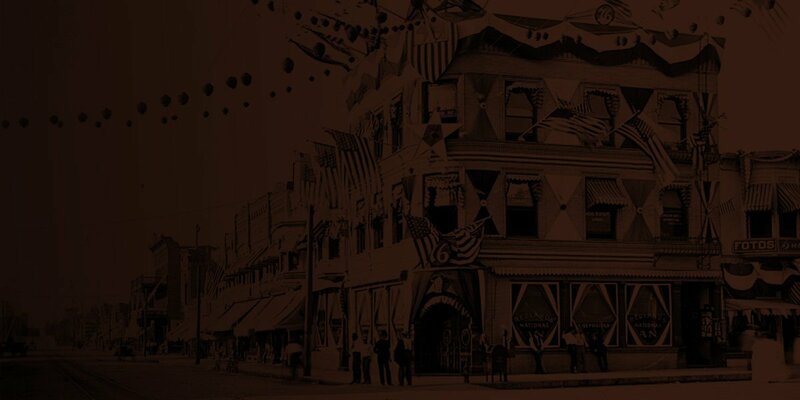 Mr. Adams, a proprietor of the Bush Bakery located at 308 Orange Street, hired the oldest building firm in Redlands to construct his home. “Josie E. Adams” was listed owner on the San Bernardino County Archives Assessor’s books. The Adams couple originally purchased the two-story cottage from the Ferguson Brothers for $2,000. Dennis and W.T. Ferguson were very much in demand for their Victorian architecture. This early photograph provides any admirer of Victorian architecture the details and craftsmanship described in the Citrograph. This cross-gabled roof features decorative gable details of cross bracing and spindle work it was once capped with ornate finials. Below the street-facing gable is a half round window surrounded with a band of decorative wood shingles. Today most of the details exist as seen in the bay window directly below the half round window in the upper story. The bay window is capped with a flared roof of decorative wood shingles. Below the boxed cornice are six ornate brackets. There is a large fixed single sash window with a fixed stained glass geometric patter transom at the top. To each side of this window is a double hung window. Left of the bay window are the partial open porch with chamfered porch supports and a wood floor. The porch is detailed with beautifully cut ornate brackets, three at each porch support. It’s railing is of stick geometric pattern. On the right side is an Eastlake style front door with two lower panels and a single glass panel on the upper half. To the left of the door is a fixed single sash window with its original “wavy” glass. The Adams home was utilized as a rental dating back to the early 1900’s. It has had numerous owner- some owner occupied and others as landlords. Current owners Donald and Peggy Christian purchased the Victorian cottage in 1969 for $8,900.00 as rental property. Mrs. Christian stated they have upgraded the kitchen and bathrooms. 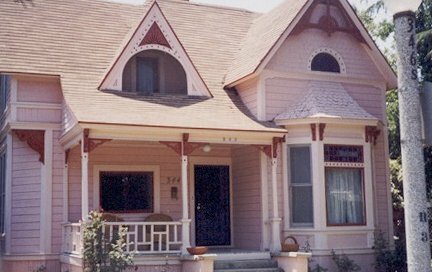 In 1997, the home was newly painted and now shows the ornate detailing. The Christians pride themselves on maintaining the Victorian architecture as seen above the porch. There is a gabled dormer-sleeping porch. The opening is arched with a decorative rising sun bracket in the gable. One can enter the sleeping porch through a single glass panel door. The south side of the house is a cutaway bay window with large decorative brackets. Above this bay and under the gable is a pair of elongated double hung windows. This gable is decorated with cross bracing spindle work resembling reverse stairs. To the north on the top story is a cantilevered boxed bay window with decorative brackets. The gable contains another example of highly ornate cross bracing spindle work. “A Guide to Architecture in Los Angeles & Southern California” lists this home as a fine example of a Queen Anne Cottage. The Redlands Area Historical Society applauds the Christians for maintaining the Victorian Architecture on this Historic property.